December 19, 2013 December 19, 2013 Nefer Khepri, Ph. D.
Deck Review: The Green World Oracle. The Green World Oracle is a very neat deck and book packaged nicely in the standard Schiffer hinged magnetic lid box. The box measures 6 X 9” and is ideal for standing on its end in the bookcase like a book so the deck will take up very little room. The box is made from a very sturdy cardboard with a heavy laminate. The cards themselves are made from a flexible cardstock with lovely laminate. They are easy to shuffle and do not stick together, despite the high humidity levels of Houston, Texas. Card backs are a deep variegated green with a stylized depiction of the earth in the center. The design lends itself to reversed cards and the guide book does contain interpretations of reversals. The guide book has 256 pages and is a 5 ½” X 8 ½” paperback. It includes an impressive bibliography and from my background in Anthropology I can easily see that a great deal of research went into the writing of the guide book. There are numerous scholarly sources cited. Each chapter also concludes with End Notes. The Green World Oracle is based upon tree veneration practiced around the world at various times throughout human history. 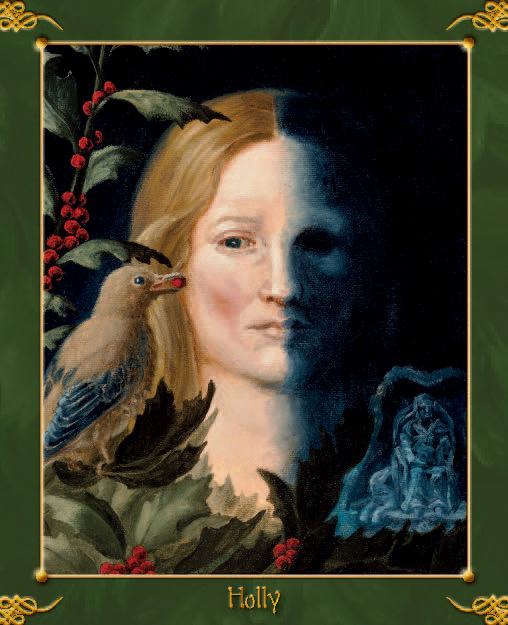 Their stories center around deities and spirits associated with the particular trees and plants. Stories are included and the guide book is really quite educational all on its own. The guide book begins with an introduction followed with a “How to Use This Oracle” section. Cards are then discussed in terms of the stories and deities or spirits associated with each particular tree or plant that is depicted. This includes their myth and cultural significance. Information on the botany of the tree or plant is also included. The guide book, therefore, makes for some very interesting reading even before you begin to use the actual cards. 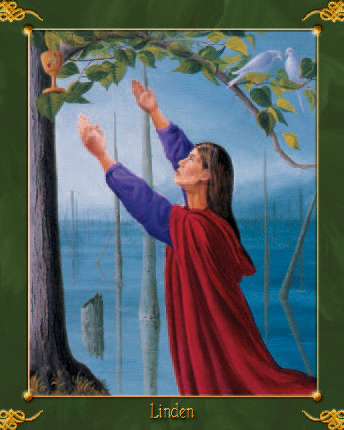 Card interpretations are accompanied by both an upright and reversed meaning. A boxed-in section entitled “Artist’s Notes” concludes the discussion of each card in which artist Sandra Stanton discusses the significance of the particular symbols included in the image on each card. Each card discussion is accompanied by a 2 ¾” X 3 ¼” black and white image of the card. 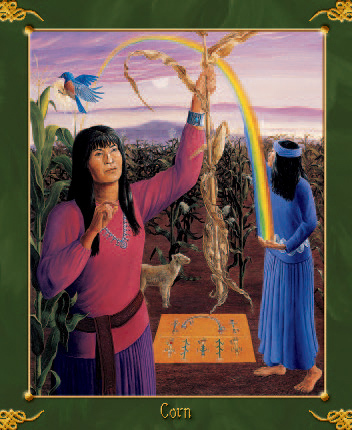 The guide book includes four spreads: a one-card message from the Higher Self, a one-card daily reading, the “Adopt a Human for the Day” Program, the Four-Card Karmic Primal Seed Layout, and this section concludes with instructions for a ritual you can carry out with a group of your friends, if you so desire. The cards measure 4 X 5”. 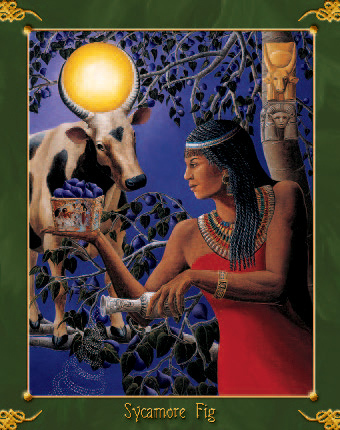 An oracle of plants and trees, human figures grace every card in the form of goddesses from various cultures around the world and through Time. The artwork has a luminescent quality to it. Sandra Stanton, the artist, uses a technique first made popular during the Renaissance of the use of an under-painting that is then layered with paints and varnish mixed together in glazes. Layer upon layer is used and this gives her paintings a rich multi-dimensional depth you do not see very often in a card deck. The images seem to shine with an inner light that adds additional grace and beauty to the images. You really have to see them to believe them. The artwork is truly amazing. The deck also has wonderful energy. I could feel it through the cellophane before I even unwrapped the box when it arrived. Images are very powerful and would make great meditation focal points if you are interested in deepening your connection with goddess energy. The Green World Oracle has mass appeal. 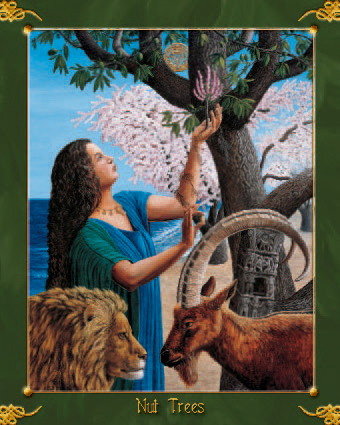 Whether you like oracle decks in general, love trees, love the Goddess, or are interested in plants and/or ancient cultures, this deck will appeal to you. I have found it quite useful. It works very well for readings on a wide variety of topics ranging from the mundane to the spiritual. Normally, oracle decks do not work well for me. That’s just me. 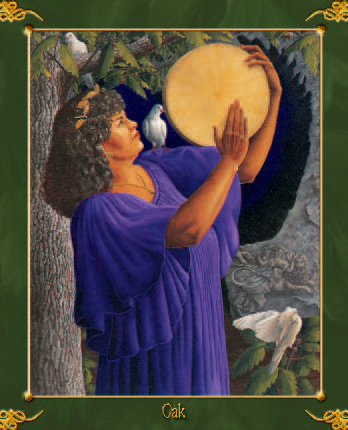 I’m primarily a Tarot and Lenormand reader; however, The Green World Oracle is one of those very rare oracle decks that works amazingly well for me and I hope you will enjoy it as much as I do. All images (C) Sandra Stanton, 2013. Next An Expression of Gratitude for a Great Actor: Peter O’Toole.